Does Apple Cake sound better in German – Apfelkuchen? When I lived in Germany I would often go to one of my best friend’s house for coffee after school. Her mom would make this amazing apple cake that was to die for! Apfelkuchen in German literally means Apple cake. Afterwards all high on coffee and the sugar from the cake we’d run around town being mischievous and young. I have fond memories of those times so the apple cake is not just a cake, and it’s not just a recipe, but it’s a time stamp in my youth. 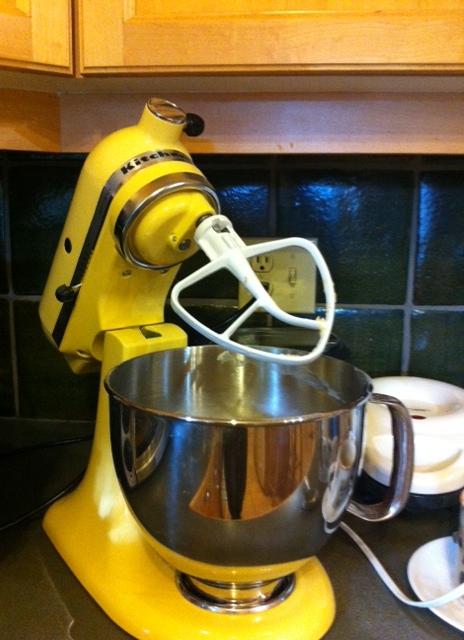 If you have a stand mixer or a bread machine this cake is a breeze. If you have to knead it yourself, well I hope you are strong like a stereotypical Bavarian muscle clad Apfelkuchen baking goddess! Mix the yeast into the warm soy or almond milk and let it sit for 10 minutes to foam up and make certain your yeast is ALIVE [echo]…Then add all the ingredients, in the order given up to the apples into your bowl and put it into your hand mixer or breadmachine and let it mix it up into a smooth dough consistency. Line a 9×13 baking dish w parchment paper (for easy cleaning and serving), and press down the dough onto it. 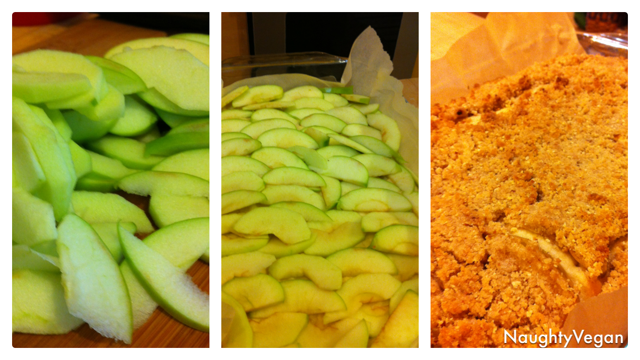 Line up the apple slices on top to form two layers and let it rest for 30 minutes while you make the topping. With a pastry knife or in a blender, blend all the topping ingredients. Sprinkle and pat them down over the cake like a crumble. Enjoy with a cup of strong coffee and then go to town and raise hell. I know this is a favourite desert amongst the…shall we say mature mannered citizens of Germany, but a slice of Apfelkuchen always brings out the mischievous youthful nature in me!! Place the chopped up apple into a ramekin bowl and squeeze a quarter of a lemon’s juice on top. Sprinkle on sugar, cinnamon, grate some fresh nutmeg and toss to mix it up. In another bowl, mix the flour, quick oats and Sucanat. Mash in the coconut oil into the dry mixture with a fork. The mixture shouldn’t be wet, but crumbly. Spread this mixture on top of the apples, and pat it gently making sure all of the apples are covered. Cook in the microwave for 2 and half minutes. Cooking time may vary depending on your microwave. If you hate microwaves, or don’t have one, you can bake this in the toaster oven at 350°F for 10-15 minutes. If you’re being really naughty then you should top it with a scoop of vanilla coconut ice cream! Yumm Yumm! I have a weakness, and it’s called breakfast! Breakfast is supposed to be a healthy meal to invigorate and energise you, so you can start the day strong! How else will you be able to take over the world, right? My weakness isn’t that I love breakfast…it’s that my breakfast has to be something sweet to have with that other addiction, the morning coffee! It’s a battle I have been sorely losing all my life. However, like all other successful peace negotiation, I have come up with a compromise for my sweet cravings and my healthy conscience! 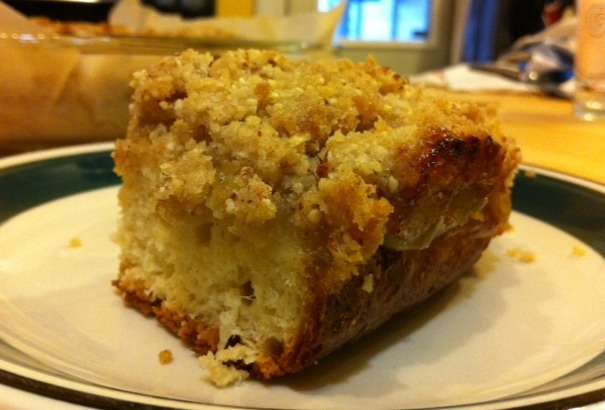 It’s called the Apple bread, or the Apple loaf. 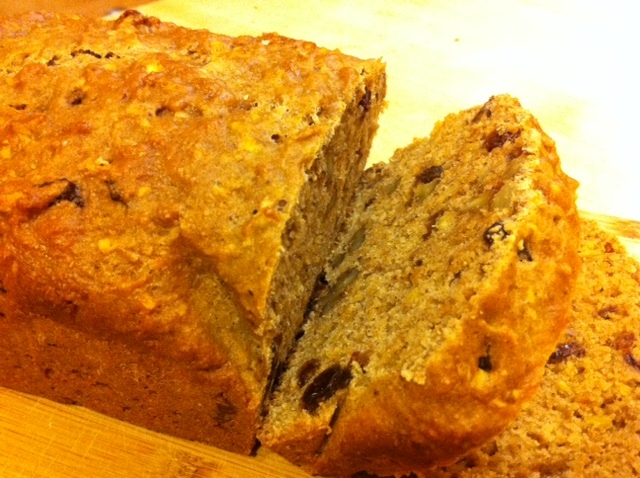 It’s the healthy sibling of Banana bread. At approximately 185 calories per slice and only 5 grams of fat, it certainly beats any Banana bread, such as Starbucks’ Banana Nut Loaf which has 490 calories and 19 grams of fat! I’m sure you’re dying to know the recipe! Let’s get to it, and for the full detailed Nutritional info of this recipe click here. Preheat the oven for 350 C. Grease a 9 x 5 x 3 bread pan, or line it with parchment paper. 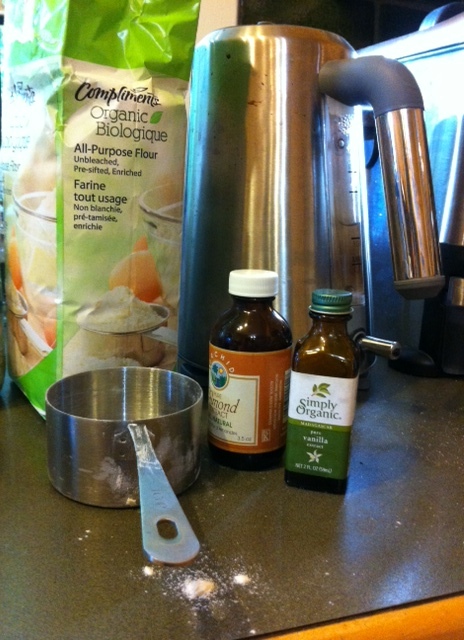 In a small bowl or measuring cup combine the soy milk and vinegar and let it sit for 5 minutes or until it curdles. Meanwhile combine all the dry ingredients (other than the sugar and the nuts) in a medium bowl and set aside. 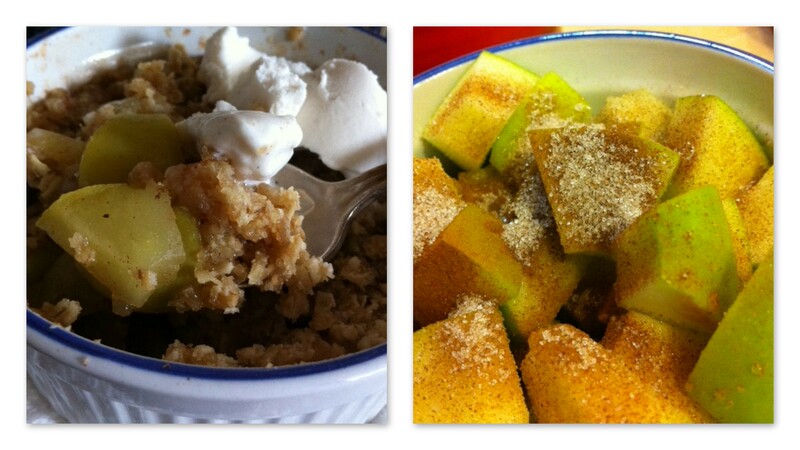 In a large bowl whisk the sugar into the oil and apple sauce. Add the curdled soy milk, vanilla and lemon zest and whisk some more. Add the shredded apples and all the dry ingredients into the wet ingredients until well combined. If the mixture looks too wet, add up to 3 or 4 table spoons of flour. 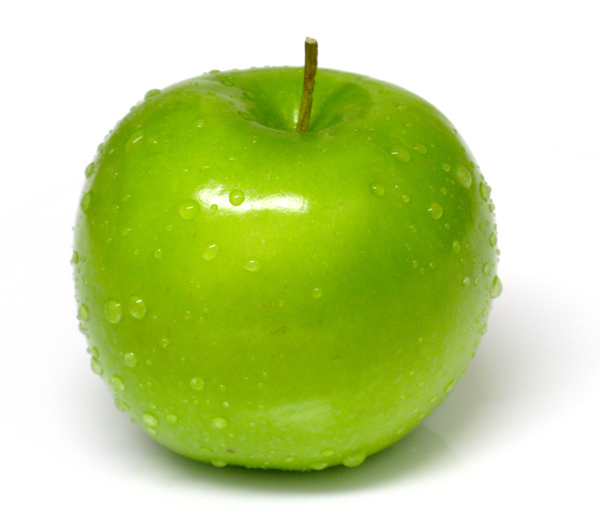 Your mixture may be wet due to the juiciness of your apples, so don’t be alarmed! Finally fold in the walnuts or pecans, if using – and highly recommend using them. Pour batter into loaf pan and bake for 45 – 55 minutes. Cool for 10 minutes before removing from pan. Enjoy with your morning coffee, or whenever your conscious battles your cravings!